Kuyt, E.. "Rail". The Canadian Encyclopedia, 24 May 2018, Historica Canada. https://www.thecanadianencyclopedia.ca/en/article/rail. Accessed 24 April 2019. Rail is the common name for some members of the rail family (Rallidae) of birds. 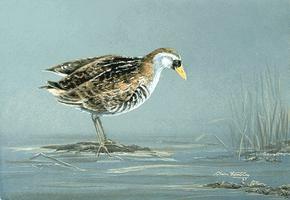 The sora rail breeds in almost every province (artwork by Claire Tremblay). 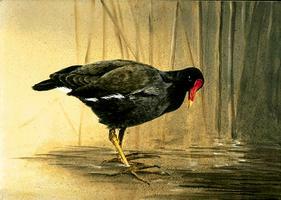 Also called the common moorhen, the gallinule breeds in a small area of southeastern Ontario and nearby Québec (artwork by Claire Tremblay). Rail is the common name for some members of the rail family (Rallidae) of birds which also includes coots and gallinules. About 140 species occur worldwide; 44 are confined to islands or archipelagos; 13 are now extinct. Many of the flightless forms have evolved on isolated islands. In North America, rails are generally tawny coloured, or with grey-brown stripes or bars. They are hen-shaped and secretive, rarely seen but often heard. They fly hesitantly, with legs dangling, and quickly drop back into the marsh where their strong legs and long toes serve them well. In Canada, the sora (Porzana carolina) and yellow rails (Coturnicops noveboracensis) breed in almost every province. Virginia rails (Rallus limicola) have a westward breeding range similar to that of yellow rails but do not occur as far north, except in Alberta. They also nest in southern British Columbia. King (R. elegans) and clapper rails (R. longirostris) occur, rarely, in southeastern Canada. Rails probe soft mud for snails, clams, crustaceans, insects and small frogs and pick plant material. Nests are woven baskets of marsh plants, sometimes roofed with plant stalks. Clutches contain 5-12 buff eggs.